After the final conflict between Steve Rogers and Tony Stark in Captain America: Civil War, Cap drops his shield to the ground, leaving it and his position within The Avengers behind. He may have also left the Captain America identity behind with it. The Russo's are doing press for the upcoming Blu-ray and DVD release of Civil War and recently spoke to the Huffington Post about the status of his famous moniker. Rogers broke out the other former Avengers towards the end of the film, and he wasn't wearing his Captain America costume from earlier when he did so. Odds are his costume will change in Avengers: Infinity War and easy guesses for replacements would be his Winter Solider gear, which itself was reminiscent of his Heroic Age Commander Rogers persona. 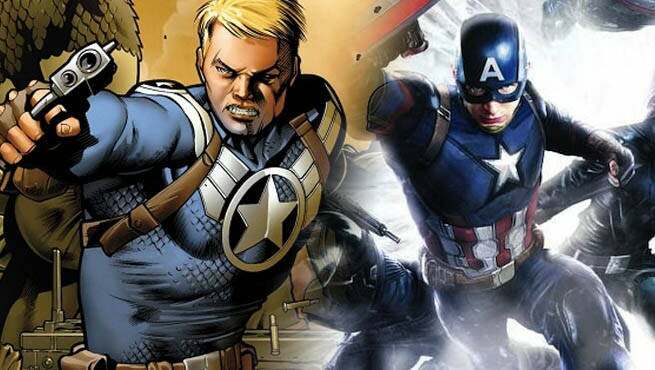 They could even draw inspiration from his more recent suit in Captain America: Steve Rogers. He has separated himself from the government on multiple occasions throughout his career, fighting crime in the guise of The Nomad and US Agent on multiple occasions, but it doesn't seem like the best fit within the Marvel Cinematic Universe. A more subtle change is probably in store for the character, and since he finds himself on Wakanda, I would expect a redesigned shield, possibly the energy shield he sported at one point in the books or a more angular shield like he has now. Since he won't likely be called Captain America, odds are he will just go by Steve Rogers, as his identity was never really a secret to begin with. Avengers: Infinity War sets down on May 4th, 2018.